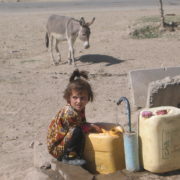 Skat was mandated by Caritas Switzerland to give technical and organisational backstopping including training on the management of water supply systems to local water companies in Tajikistan. The aim of the mandate was also to make an assessment and provide recommendations to plan and implement a following project in the water sector. After having provided two consultancies for the Local Development Muminabad (LDM) project it was expected that with additional backstopping, the drinking water component of LDM would be improved. On the technical side, remaining questions regarding the pumped systems mainly related to difficulties with power and break down of electricity supply had to be addressed. On the management side, water fee collection, ownership of water systems and capacities remained unsolved problems that required further support and advice. In order to reach optimal sustainability of project aims (facilitating and capacity building of local actors; i.e. the local engineer of LDM, local field engineers and the NGO Drinking Water Society in their role as service providers for the Water User Committees on village level), the mandate also included capacity building and training. The backstopping mission of Skat contributed to the concretisation of recommendations given in the mid-term and external evaluation as well. Additionally, in order to capitalise and scale up the experiences of the approach, a new project was designed and proposed to SDC for further planning and financing. Skat provided the assessment for the development of this project based on stakeholder review and the elaboration of a draft project sketch.